The way the British royal family handles special occasions is interesting, to me anyway, because everything they do has to be examined in advance through history, tradition and protocol. Then the next day, many, many other people run out and do as close to the same thing as they possibly can. The last few generations of the royal family have provided boatloads of drama that have kept the tabloids chattering and the rest of us agog — romance, opulence, star-crossed lovers, betrayal, tragedy, untimely death. This week, in the runup to the wedding of Prince William and Catherine Middleton, Birth Story is going to look at a few royal births. We begin with Prince Charles, William's father, born at Buckingham Palace on Nov. 14, 1948, to then-Crown Princess Elizabeth, 22, and her husband, Prince Philip. Philip famously played squash with a friend in another part of the palace during his son's birth. To be fair, in 1948 most fathers were at best pacing in hospital waiting rooms during their children's births. And, Philip did bring Elizabeth carnations and Champagne afterwards. 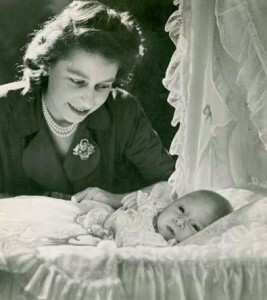 Just two weeks after Charles's birth, in a letter recently sold at auction, Elizabeth wrote a cousin, a bridesmaid at her 1947 wedding,"The baby is very sweet, and Philip and I are enormously proud of him. I still find it hard to believe that I really have a baby of my own!"